I'm going to be honest, my weekend wear is not so different from my regular weekday workwear. But there's a few little tweaks here and there I like to add, that make weekend dressing a breeze. Who has time to try on 20 outfits every Saturday morning? Not me! Well maybe me 2 years ago, but not with a toddler who's saying 'GO GO GO', putting on her jacket and walking towards the door. So to me weekend dressing is all about speed dressing, that's practical and still looks chic. 1. Starting with the kicks. I just bought these Vans Old Skools as an alternative to the Stan Smiths we've seen everywhere the past few years. Ok I don't skate, but doesn't mean I can't admire skate culture ;). Comfy sneakers are key to winning the weekend. 2. Layers. A denim jacket or knit cardi is perfect this odd weather, when one moment it's sunny and the next there's a downpour. 3. Cross body bags are mandatory when it comes to juggling coffee and some kind of carb. I've learnt that the hard way. 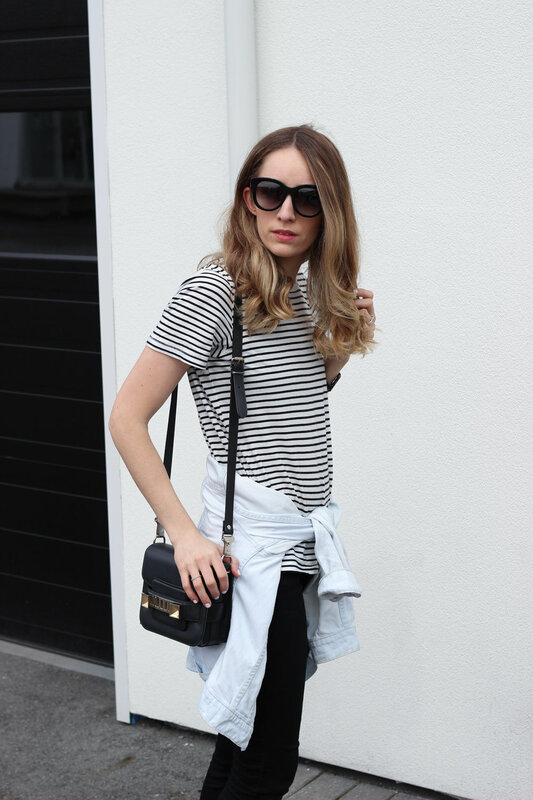 + ADD a comfy striped tee and black jeans = you're good to go!